This 1940s wartime era photo prompts a nostalgic moment for me, even if I wasn’t around back then and my soggy sentiments have nothing to do with the picture itself. This is the old Madison Square Garden in New York City, and the marquee features coming sporting attractions, including basketball games featuring Valparaiso University (my undergraduate alma mater) and New York University (my law school alma mater). 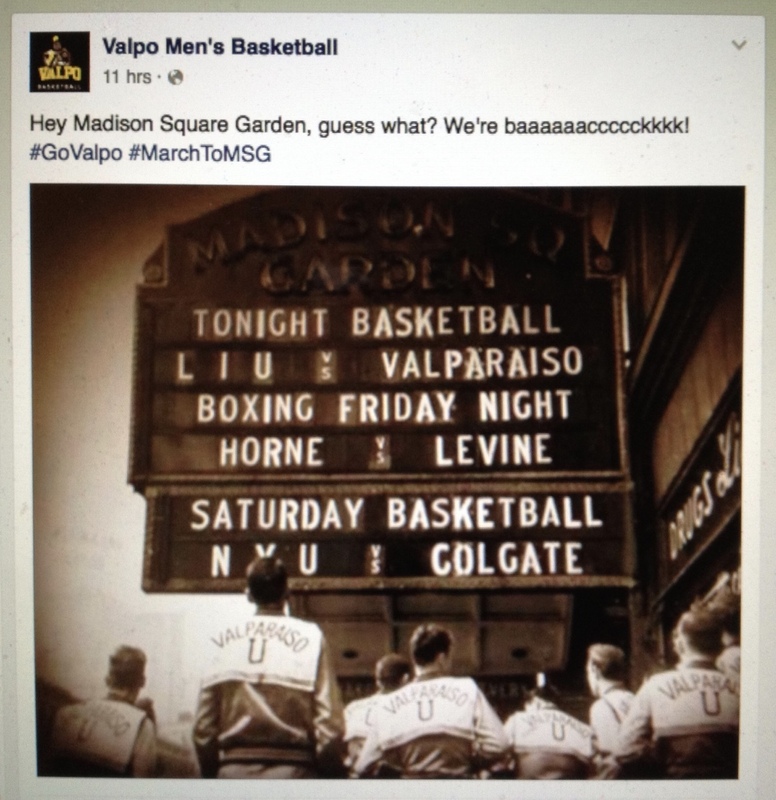 Valparaiso posted the pic to its Facebook page in connection with the appearance of the current men’s basketball team in the semifinal round of the National Invitation Tournament, which will be played in the modern Madison Square Garden next week. This year’s squad has set a school record for wins, including three in the NIT. A victory against Brigham Young University on Tuesday will put them in the tourney championship game, to be played later in the week. The vintage photo shows VU players arriving for their game at the Garden. VU’s war-era team was one of the nation’s best, thanks to its successful recruiting of talented players who were too tall to enter military service. The team traveled all the way from the Hoosier State to play Long Island University, no small journey in the days before jet airliners. The second marquee game featured NYU hosting Colgate University. NYU was a major college sports presence during the first half of the last century, and its basketball team played in many of the prominent arenas along the east coast. Today NYU is a non-scholarship Division 3 school, with men’s and women’s basketball teams playing very competitively at that level. We all have our personal narratives, and part of mine involves growing up and going to college in northwest Indiana, discovering something of the world during a final collegiate semester abroad, and then heading off to law school in New York City. To see both Valparaiso and NYU on that marquee, located on the wondrous island of Manhattan, symbolically brings together two educational institutions that have played important roles in my life. As for Madison Square Garden, when I lived in New York I watched my share of basketball there, mostly Knicks NBA games. It was still possible back then to get cheap tickets (four dollars, then eight dollars) to sit up in the nosebleed seats. But when the Knicks were on top of their game and the Garden was rocking, well, it didn’t matter where you sat, it was quite an event. After VU’s home court victory over St. Mary’s of California that punched the team’s ticket for the trip east, the public address system played Frank Sinatra’s “New York, New York.” That was my song, too. I hope their Manhattan sojourn turns out as well for them as it did for me.